Posted in Art, Instruction, Youth. 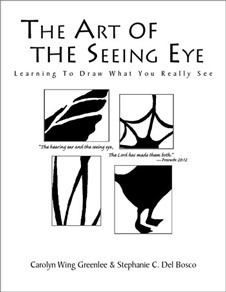 Ten lessons with explanations, examples, exercises and evaluation instructions designed to encourage the Right Brain to see more accurately—to judge space and relationships, and to notice. By art teachers Carolyn Wing Greenlee and Stephanie C. Del Bosco, who have successfully used these methods on students of all ages over the past thirty years. Permission is given to photocopy exercises for use of the immediate family. Rates for Charter and Christian schools available on request.